One of the benefits you’ll enjoy when working with Parasol is the ability to claim and be reimbursed for legitimate business costs and expenses – as long as they’re incurred during an assignment. The types of costs and expenses that can be claimed and reimbursed are dependent on the type of assignment you’re working on and whether it’s subject to supervision, direction or control (SDC). These are pre-agreed with and paid by the end client or agency so must be approved by the end client or agency upfront before the expense occurs. In order to be paid tax and NIC free by Parasol, the client billable expense must be within one of the categories on the MyParasol portal. These types of costs are always paid tax and NIC free regardless of the type of assignment you are on and include electronic equipment, parking at or near the assignment, training & tuition costs and text books. All of these items require receipts. The costs of electrical equipment such as an iPad or laptop can be claimed for and reimbursed, provided they’re essential for the assignment. Software counts as well. There’s no limit to the amount that you can claim, as long as you detail how each purchase supports your role. It’s also possible to claim and be reimbursed for the costs of any courses or training that you complete and any text books that you need – provided it’s related to your role. If this is a requirement for the current assignment, there’s a good chance that the request will be accepted. Any non-work related qualifications aren’t eligible for reimbursement. 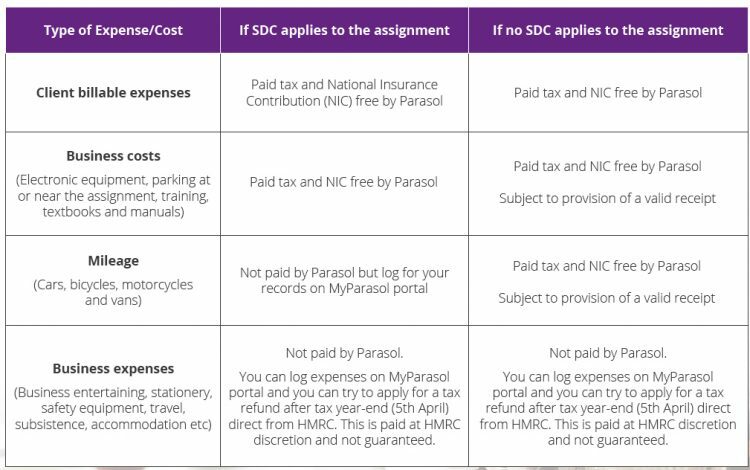 Mileage to and from the assignment and home can be claimed and reimbursed tax and NIC free if no SDC applies to the current assignment upon provision of fuel receipts. Mileage rates apply to bicycles and motorcycles as well as cars and vans. The table below outlines the current approved mileage allowance payments (AMAP) you can claim for. This covers things like business entertaining, stationery, safety equipment, travel, accommodation and subsistence. You’ll be able to apply for a tax refund from HMRC on these expenses after the end of the tax year (5th April) either via a self-assessment tax return or a P87 form. We hope this guide sheds some light on how easy and beneficial it is to claim and log legitimate business expenses and costs. If you need more information, please call 0800 458 0818 or email: enquiry@parasolgroup.co.uk. Based on the details of the assignment, it might be worth considering going limited. That way, as long as you’re outside IR35 you’ll still be able to claim all expenses tax and NIC free as and when you incur them. Our sister company ClearSky Contractor Accounting is the go-to provider for this. And if you aren’t sure whether this route is for you, simply give our best advice team a call on 0800 458 0818. They’ll be able to talk through your options based on your own circumstances.